OK, this isn’t my first attempt at a sweater, but it will be the first I finish, by gum! It’s for my grand-nephew. The first in his generation. If I was a really great great aunt, I would have started a baby jumper when I first heard my nephew’s girlfriend was having a baby. I keep on thinking “babies having babies” but mum is 25! It’s me that’s getting old. So I’m making this a 6 month size because well, I have a bad track record for slow knitting. about 1/3 through. sleeves and part of the back. link to ravelry project. I was attracted to a simple drop-shoulder jumper from “What to knit when you’re expecting”. I started on the sleeve, because then I could sort of double it as a swatch, and if it worked, yay! But it didn’t work. I had the right stitch gauge but my row gauge was waaaaay off. The sleeve was come out very narrow and long, I knew something was wrong. Because there no schematics in this book, you don’t have an easy way to check. So you count the number of stitches x gauge to find out I should have been making something that would be 5 inches x 10 inches. And this was coming out more like 5 inches x 15 inches (if I had kept on going). Matching gauge?? That would take magic! I was told “swatching” is a dirty word, and now I can see why everyone is frustrated by this. I mean what are the ODDS of actually getting the same exact gauge as the designer?? I’d say pretty slim. Even if you used the same exact yarn and the SAME exact needles. And the trickiest part of the pattern I’m attempting is a simple trapezoid sleeve… What about patterns with loads of shaping? That’s why I’m excited about Dani Sunshine’s workshop for Unwind Brighton: Do I really need to swatch? I can’t change my needle size in this case to “match gauge”, and I don’t think I’d want to. The fabric with this yarn is just fine. I bought it in the US at a local yarn shop near my sister’s. With 4mm, the fabric is firm, but flexible and springy. This doesn’t seem advised for a beginner, but I was surprised… turns out a drop-shoulder pattern isn’t that hard. I found this really great tutorial on SlippedStitches blog: Baby Sweater Sizing Standards What You Need To Know Before You Buy A Pattern The author gives standard baby sweater pattern sizes with schematics so you can make up your own. Now I calculate how many stitches + 2 for seaming, and I was off! I used graph paper were 1 sq = 1 inch to make it easier to visualize. Well there was some back and forth with frogging, but I finally have two sleeves, and starting on the body now. Since it’s straight it’s just smooth sailing. I wish I had just done it in the round, but I think practicing seaming will be good. 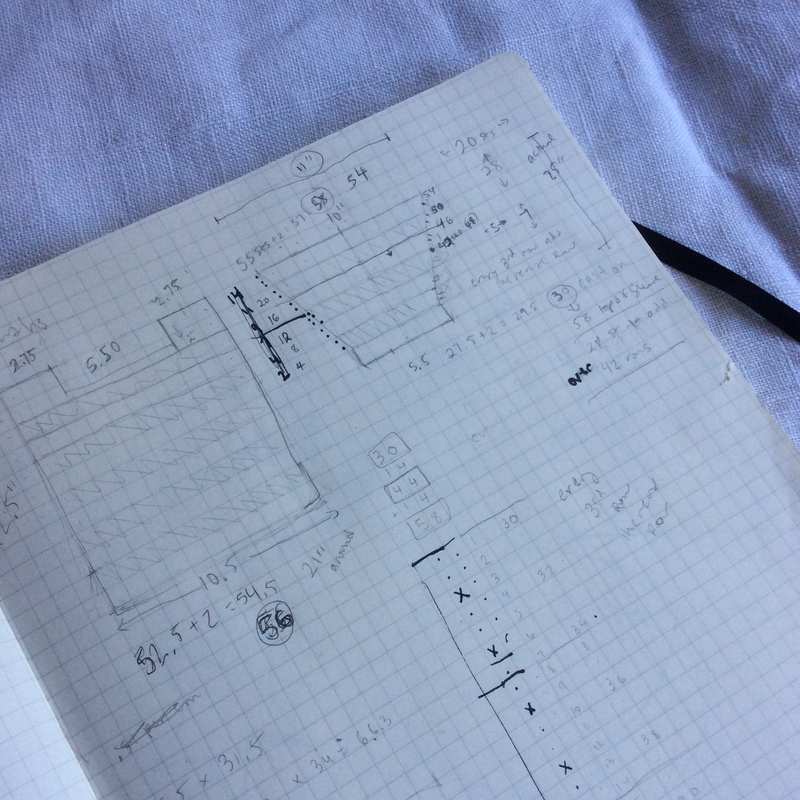 What I’m confused about is… doesn’t a knitting designer have to make schematics anyway? Why didn’t the publisher include them? I don’t think I’ll knit anything else from “What to knit when you’re expecting”, well unless I make up my own schematic for the patterns. But but but… why not just include them… *sigh* saving paper? I have no idea. So I asked the kind folks on Ravelry for some tips on baby patterns and books that DO have schematics. All of the Tin Can Knits patterns have schematics. Here’s an example of their gramps cardigan.They have: 9 months of knitting. All the Sublime baby books have a schematic. Drops Design patterns are free and have schematics. I was looking for fun funky stuff, rather than just the twee usual suspects. I found this awesome site: 100 Baby Sweaters. Stephanie, the designer, said that ALL her patterns have schematics. She also has some free patterns in both crochet and knit. Like this cute cat hoodie in knit or crochet. And LOOK, Andy Warhol for a kid! I’m assuming there must be more, but it would be helpful if publishers opted to include schematics AND if they also marked their patterns as “has schematics” in Ravelry. If they do that then their patterns will show up in a search for that pattern attribute: “has schematics”. Voila! Babies also vary so much in size that not having a schematic makes even less sense. My friends’ six-month-old is wearing (commercial) one-year-old clothing, so how can I tell which age/size to knit for him without concrete measurements? I’m glad Ravelry has ten pages full of patterns with schematics though – and congratulations on successfully writing up your own pattern! Wow yeah, good point. I’m making a 6 month old size, but who knows it might fit the baby sooner then I think. Better not wait til Christmas to give it to him.